Vilayvong is our top guesthouse pick for flashpackers looking for bright, new and clean rooms. Ad Book now! Rates from US$26++. Average rating 7 from 503 reviews. The guesthouse, located a block north of the toll bridge, has undergone significant expansion over the past couple of years and what used to be a cluster of simple bungalows now includes a new towering building with modern rooms that represent excellent value. We’ve been throwing our pack down here for years because of the view. Rooms on the fourth floor are absolutely worth the price and the climb up uneven narrow steps – high above the rooftops, the views of the mountains are phenomenal and there’s nothing quite like waking up to that sight. The private balcony is a relaxing spot to observe darkness and calm descending on the mountains in the evening. The rooms are comfortable, big and smartly designed, with clean tiled floors, bright lighting, desk, TV, minifridge, floor-length mirror, luggage rack, bedside table, plugs and a window so you can see the mist rising over the karst from your bed. Since it’s a new building, that also means new mattresses, pillows and linens. Ensuite bathrooms are enormous tiled affairs, with a tiled countertop, hooks and a hot water shower at the far end, so not everything gets wet. It’s unfortunate that they taped up the mirror rather than figured out a way to install it, but that’s Lao bathroom engineering for you. The drawbacks are that breakfast is not included and WiFi is available in the reception area only; there are also lockers in the lobby that you can use. The old wood and brick bungalows remain but do not have any views. The bungalows’ entrance and front porch face the back of the hotel building, plus it faces east, which means no sunlight in the afternoon. Skip the bungalow, and go for the rooms on the top floor. The hotel is popular with small groups tours so the reception staff are more professional and switched on than most guesthouses and rooms are often full. However, this isn’t a place where you socialise and meet people. 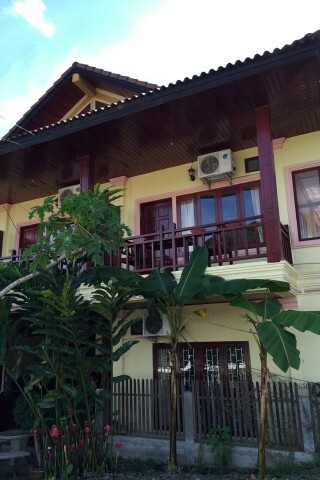 Check rates at Vilayvong Guesthouse on Booking.com.